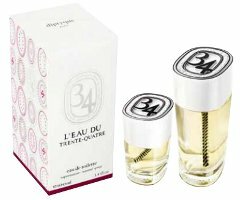 L'Eau du Trente-Quatre is the latest from French niche line Diptyque, and is meant as the second chapter to (or the springtime variation on) the story started with 2011's 34 Boulevard Saint Germain. If you remember, that one was meant to capture the essence of Diptyque's flagship store in Paris, hence the street address; both "chapters" were developed by perfumer Olivier Pescheux. I liked 34 Boulevard Saint Germain, but like Kevin, not so much that I was tempted to add it to my buy list. L'Eau du Trente-Quatre won't make the list either, but I do like it a little better. It's brighter, crisper, greener, and more summer-y, and while you will still find echoes of 34 Boulevard Saint Germain's "Diptyque — The Greatest Hits" theme (the most obvious nods to my nose are to L’Ombre dans L’Eau and L'Eau, but there are also elements of Oyédo and Do Son, among others), it's possible to just enjoy it as a lively variation on a unisex summer citrus cologne, with a nice kick of spice, decent longevity, and a musky woods dry down with a light powder finish. It's enjoyable and easy to wear, but for my money, not as much fun as some of Diptyque's other summer citrus possibilities, like L’Eau de L’Eau (another Olivier Pescheux, spicier and darker than L'Eau du Trente-Quatre) or the still-crazy-after-all-these-years Oyédo (fizzier and sweeter). Diptyque L'Eau du Trente-Quatre is available in 50 ($100) and 100 ($135) ml Eau de Toilette. The notes include bitter orange, verbena, lemon, grapefruit, lavender, nutmeg, juniper berries, cinnamon leaves, birch tree leaf, geranium, tuberose, Virginian cedarwood, patchouli, incense, labdanum and musk. For buying information, see the listing for Diptyque under Perfume Houses. I am still tempted by Volutes, so just as well! I love this. Bought a bottle. I was looking along the lines of Astier de Villette eau de colognes (L’Eau Chic, etc). If any knows the AdeV line and sees a similarity or cares to make a comparison, please comment! Thanks. Oh good! I liked the Astier Villates too, but not enough to buy. Kevin reviewed the Eau Chic. I was very disappointed in this one. I found it genuinely quite unpleasant. I really like Boulevard Saint Germain though. I was tempted long enough and bought Volutes this weekend. They put in a sample of this one and 34 Blvd.. Volutes does not say summer to me anyway, so maybe that is when I will try this one out. I am jealous — I’d like a bottle of Volutes. Did you get the EdT or the EdP? Edp!! I buy 1-2 bottles a year and this and en passant were it. Those samples really do bring me back, just takes 12-18 months. They have the Edp in the SF store in a jar with a lid and when you lift the lid then it drifts up. A nice display. Thanks for the review, Robin. This one burst on the scene before I had advanced notice and I was momentarily excited. I *did* buy 34 unsniffed (to split), but I never really connected with it. Brighter sounds good, but I don’t think I’ll need this either. Any reference to L’Ombre dans L’Eau means it’s probably not going to be good for me (I think that’s the problem with 34. Of the colognes, my favorite is L’Eau de Tarocco (which is one of my staple colognes), followed by L’Eau de L’Eau. It’s a good line of colognes, and I think I’ll like it better than the 34/Trente-quatre duo. I like the colognes better too. I adore L’Ombre EdT — not sure you can like this if you don’t like that? But just a guess.